Where were you when the weather bomb hit? I was waiting for the crazy to arrive, but it seems to have changed its flight plans. I didn’t even know ‘weather bomb’ was a real term until I looked it up. What does one eat during an impending (but never arriving) weather bomb? Squash soup, of course! 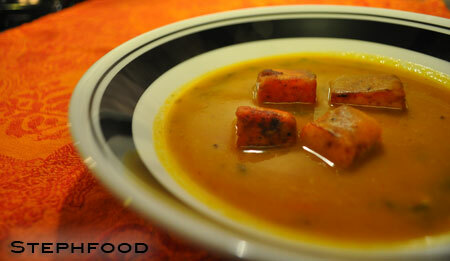 Over the years, I’ve made a few different squash soups, with varying degrees of success. Some turned out bland, while others were waaay too spicy. Most of the time, I go for something curried – I started with Thai spices, and ventured into Indian. Along the way, I think I’ve developed a pretty good base for the soup – mostly squash, with some carrot to round out the flavour. Whether this is needed really depends on the squash you use… I add carrot all the time now, just because I like it. I also add Granny Smith apple to the blend, to give a hit of sweet and sour. Some of the recipes I found over the years called for sugar — by adding an apple or two, you can avoid that. This time, I pulled some spices from my masala dabba and seared some paneer to give us something to chew on. This is a nice toasty, warming soup that’s great on a cold and/or blustery day! Or Tuesday. In a large pot, heat the oil over medium heat. Add the turmeric, garam masala and 1/2 teaspoon of the kala jeera (cumin). Let the spices cook until fragrant. Sauté the onion and carrot for 5 minutes. Add the apple, garlic and jalapeño and sauté for an additional 5 minutes. Add half of the broth, and let it all cook for about 20 minutes or until the carrots soften. Once the carrots are soft, add the baked squash. Using an immersion blender, purée everything in the pot until smooth. Be sure there is enough liquid to completely cover the blender – add more broth as needed. If you use up all of the broth, you may add water from here on, until you get the right consistency in the soup. I prefer it to be thick enough to coat the spoon, but not so thick that the spoon can stand up in it. Turn the heat down to low, and let the soup simmer. Add the asafoetida, mustard seeds and the remaining jeera. Cook for an additional 10-20 minutes to let the flavours combine. In a small skillet over medium-high heat, add a little bit of oil (I used an oil sprayer for a fine mist). 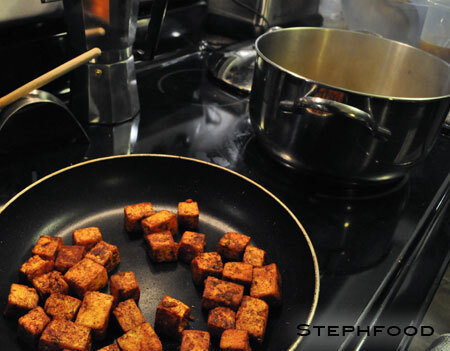 Lightly fry the paneer cubes until they start to brown. Mix the paprika and cayenne together, and lightly dust the paneer as it continues to fry. Toss the paneer, and continue to coat until they are nicely coated (doesn’t need to be perfect) and all of the spices are used up. Fry until lightly crispy on the outside, and still soft and chewy on the inside. Add the fried paneer and cilantro leaves to the soup. Serve the soup with some nice bread to help sop it up!! J made us a fantastic multigrain loaf that looked like it came from a magazine. Holy crap this looks awesome. Another bookmark for when I escape Midland and find some spices that aren’t Basil, Thyme and “oh-re-gah-no, what the hell?”.